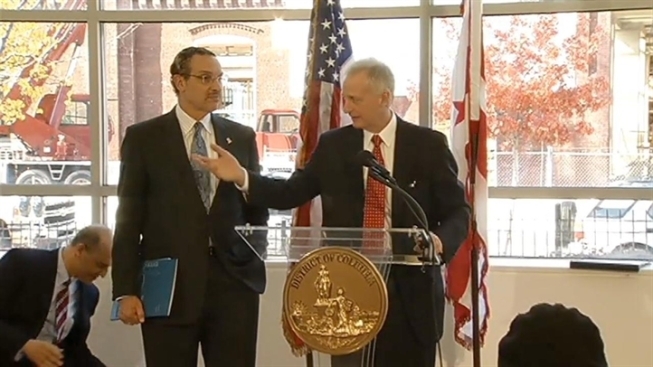 D.C. Mayor Vincent Gray announced Wednesday a plan to create 100,000 new jobs in the city over the next five years. The city is doing well economically, Gray said, and he wants a diversified workforce that's not dependent on federal government jobs. He wants the city’s booming economy to help provide more medical, hospitality and retail jobs. “It's yet another effort to keep our dollars right here in the District of Columbia,” he said. Surrounded by developers, neighborhood activists and university officials, the mayor said his five-year plan would add $1 billion of new revenue to the District in five -- including long-struggling wards 7 and 8. “When you talk about Microsoft locating in Ward 8 of the District of Columbia, that probably would have been considered heresy not so long ago,” Gray said. The 11-acre site of the city's old convention center -- long vacant -- is rapidly being transformed into a multi-billion dollar development. Tenth Street, closed since the early 1980s, reopens next year. D.C. Council Finance and Revenue Chairman Jack Evans said the city aggressively has been pushing serious development for two decades. Reporters asked Gray -- who's 2010 election campaign has been under federal investigation for more than a year -- whether he'd be around to see the development and run for reelection in 2014. D.C. also has a bad reputation for being too bureaucratic, too unfriendly to business. The mayor said he'll change that, too.